Welcome to Cued Speech UK > Blog > Blog > Education > Eggbuckland Vale School is thriving! Eggbuckland Vale School is thriving! and deaf children are thriving! Sarah is a teacher of the deaf from Eggbuckland Vale Primary School in Plymouth, which provides inclusive education for eighteen deaf children from nursery age to Year 6, in a centre staffed by a whole team of specialist trained support staff, which includes a speech and language therapist. The team all help create a visual language rich environment, where British Sign Language (BSL) and English are represented equally. 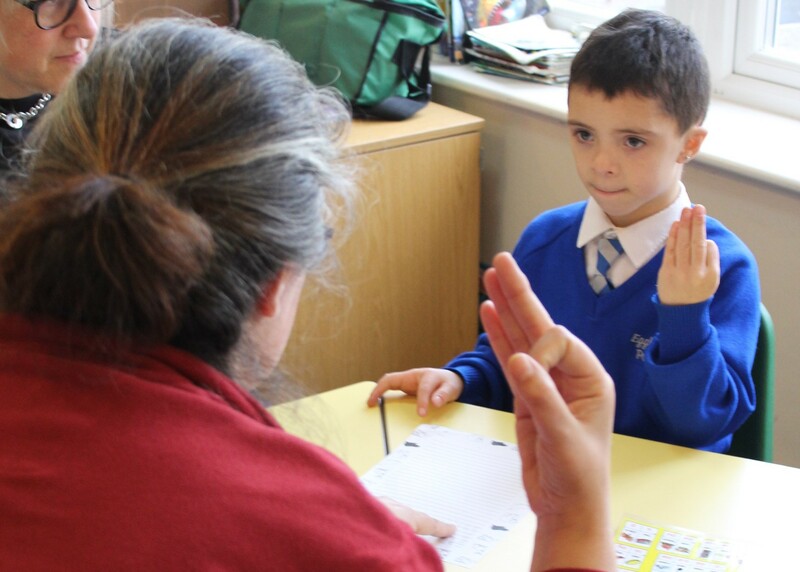 As an experienced teacher of the deaf of four years, Sarah was troubled by the significant language gap which was apparent between the deaf children and their hearing peers during their primary school years. Sarah explains that it is all too common for the centre team to see deaf children to arrive at school at the age of 4 or 5 years old, with the language abilities of an 18-month-old hearing child. For deaf children, arriving at school for the first time presents a significant challenge, when they are immediately expected to start learning to read and write. They just don’t have the language to be able to do this yet. These children are more often born into hearing families who initially have no ready means to provide their deaf child with a full and expressive language. Unwilling to be content to allow these deaf children to miss out on their early years education, fail to achieve full literacy and risk a future of poor outcomes, Sarah and her colleagues were determined to find a way to close the language gap and find a method to help these deaf children build language quickly enough to enable them to firmly establish their literacy skills – the key to their education. She looked at Visual Phonics by Hand, which she found worked deceptively well initially. When used with BSL and fingerspelling, it allowed Sarah to teach the alphabet and some spelling choices. She used this method for a year with six deaf children who quickly picked it up, due mainly to it being a visual method – using gestures – which the deaf children immediately responded to. Buoyed by this initial success, Sarah was surprised and frustrated to find the method fell short when she wanted to help the children blend sounds – to bring together consonants and vowels to create meaning, by forming words and sentences. The children just couldn’t understand. Visual Phonics by Hand can only show one sound at a time and it didn’t give them an understanding of how spoken words are actually formed; that words are made from strings of sounds blended together and how mastering this understanding leads in turn to English spelling choices. How then do you make spoken English visible and our spelling system understandable for deaf children? Little over six months ago, while attending their local Children’s Hearing Services Working Group meeting (CHSWG), Sarah and her colleague, and fellow teacher of the deaf, Vicky Lowther both listened with peeked interest to a presentation about Cued Speech. Here, to their amazement, was a system which revealed the whole of spoken language manually and allows deaf people to see all of what anyone using it is saying. This was defiantly the solution to her challenge. Since their discovery, Sarah and Vicky have transformed the hearing support centre at Eggbuckland Vale so that staff members are learning how to reveal the whole English language visually through Cued Speech – used equally alongside BSL – to be able to provide a truly bilingual environment for the children. These deaf children are being encouraged to use their dominant sense ‘vision’ to learn to read and write spoken English. In just the short space of time after Sarah and Vicky introduced Cued Speech to their school, the outlook for their deaf children has been transformed. Their deaf children are making remarkable and accelerated progress with their literacy. Children who arrive with behavioural difficulties and a paucity of language are immersed in and captivated by a world of visual language – both BSL and English through Cued Speech – which enables the children to thrive. Sarah gives the example of D who she says didn’t fit in when he first came to her. Using Cued Speech to immediately get D started, means he is now excitedly writing meaningful sentences in English – a language, only a short time ago, hidden from him altogether. His success is fuelling his desire to know more, and Sarah says, ‘he now sees himself as a learner – he knows he can succeed’. Not content with being satisfied with the centre’s achievements, Sarah is determined to take on her next challenge. She has set up a monthly parent’s group, where she hopes parents of deaf children can learn how to prepare their children for school. If the parents learn how to reveal their own spoken language to their deaf children through Cued Speech, these children will not only feel more included in their own families, but they will also be arriving at school with all the language they need to start learning to read and write, from day one. If you have a deaf child or want to learn more about Cued Speech, you can contact Cued Speech UK by phone (01803 712853) or by email (info@cuedspeech.co.uk). Cued Speech UK would love to see what you have to say!